DK and Diddy in the forest. 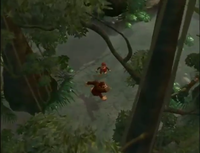 The Forbidden Forest is a location in the Donkey Kong Country television series. Located on Kongo Bongo, it is where the rumored Bog Monster lives and the events of Bug a Boogie take place. When DK was a kid, he saw the Bog Monster, which was really Cranky. Donkey Kong and Diddy tricked King K. Rool after Klump and Krusha stole a Bananaphone from them and wanted to get back at them and "teach them a lesson". They tricked King K. Rool by saying they found a magical amulet they hid in the Forest (which was really Funky's hood ornament). After King K. Rool heard this, he sent Klump and Krusha to go find it. DK and Diddy went back to Cranky Kong's Cabin to tell Cranky about their "joke". Cranky, once he heard this, told them it was a "Magical Amulet with evil powers. Then he told them to hide it in the "Well of Woe in the Forbidden Forest", which sent them there too. Once there, they look for the well and after searching, found out by Cranky that it was fake. Meanwhile, Klump and Krusha are sinking in quicksand. They do manage to get the amulet, but they find out that it's worthless. This page was last edited on December 25, 2018, at 04:22.